You don’t have to be an astronaut or rocket scientist to make a great contribution in aerospace and STEM education! Read this article in CollectSpace about a new initiative called ShareSpace which John Travolta and astronaut Buzz Aldrin are partnering on with a launch in 2015. This is fantastic news for anyone who wants to encourage and support STEM education and STEM careers. There are many kids who have passions and talents in these areas. And we still need more rocket scientists! As I describe in How To Be a Rocket Scientist, there are still many interesting and important problems we need to solve in the aerospace fields. 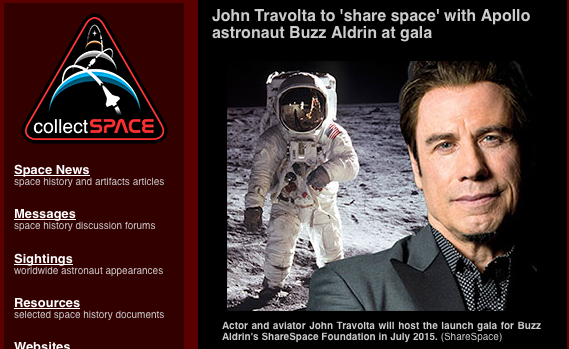 The ShareSpace organization website has more details. Use that for more information or to get involved. You’ll see that they actually promote the effort of STEAM education, which adds the Arts into the mix. A STEAM education is recognizes that a well rounded person needs a well rounded education. If you want an inexpensive but powerful resource to help you as a parent, educator, or young person eager to make your own contribution toward our space-bound future, my book will give you 10 powerful tips that you can start using today. Thanks for your interest and support for aerospace and STEM education!